Can I be honest with you? 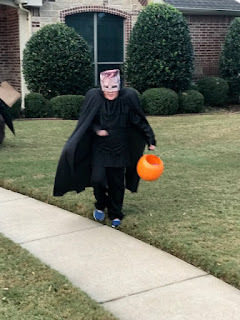 I usually love Halloween but I was just not feeling it this year. Ryan's sick and I didn't feel my best. It was cold and rainy. But, B-man would not be deterred. I tried. I showed him the 2 giant bags of candy we bought at Sam's Club. I promised him a lot of it if we could just stay home. He wasn't having it. 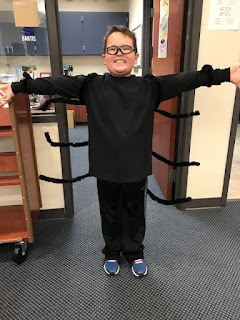 B chose his costume several weeks ago. 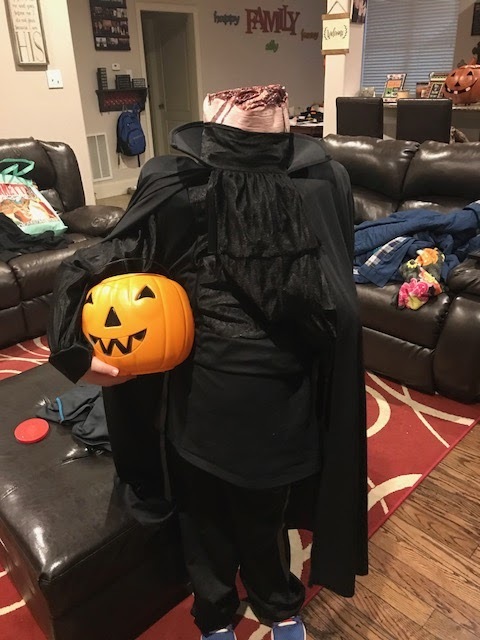 He wanted to be the Headless Horseman. My sainted mother ordered it from Amazon so I didn't have to brave anyone's costume aisle. Thank you, Momma! When the costume arrived we tried it on and B had a full out panic attack. The mask goes completely over his face and then the cape thingy comes up over that. No part of his face or head are showing. So, you can see why I thought he could be bribed into staying home. At school they could buy a ticket to wear a costume. He was so excited to pay for this out of his own money. However, the note said "no blood or masks". Ummmm, brother you're costume is bloody and a big ol' mask. What are you going to do? 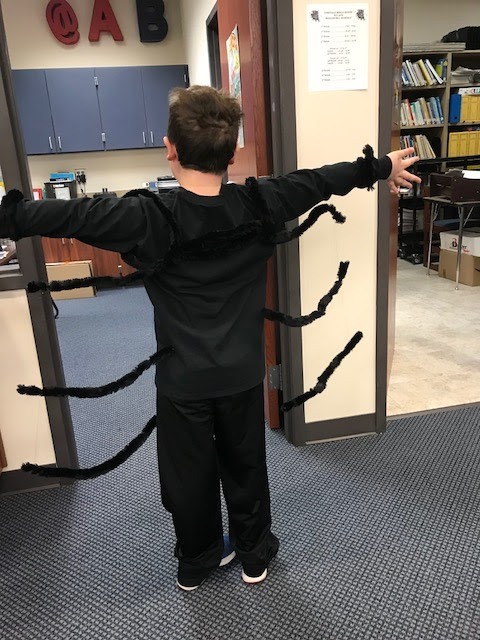 Momma, you're going to make me a spider costume. So I did. After a lot of deep breathing (and a small hole cut out for breathing), B got into his Headless Horseman costume and we met some friends in the neighborhood. As you can see the full on mask didn't last long. Thankfully, it wasn't raining. Also, thankfully, B was done after a few houses.